Russian opposition politician Alexei Navalny prepares for his interview with the Associated Press in Moscow, Russia, Dec. 18, 2017. As the most serious challenger during Vladimir Putin's 18 years in power, Alexei Navalny has endured arrests, show trials and facefuls of green antiseptic that damaged his vision. But in an interview Monday with The Associated Press, he said the biggest thing keeping him from becoming Russia's next president is a political system that punishes him for rallying support and conspires to keep his face off the airwaves. Putin's approval rating is astronomical and he is widely expected to win another term with ease, but the fact that he won't even say Navalny's name suggests the anti-corruption crusader has struck a nerve. Navalny's criminal record will probably keep him off the ballot — a sign, he says, of how much he frightens the political class. Navalny, in his first interview since the start of the presidential campaign, said he would win it "if I am allowed to run and if I'm allowed to use major media." And he said the Kremlin knows it. FILE - Russian President Vladimir Putin smiles during his annual news conference in Moscow, Russia, Dec. 14, 2017. "It's the main reason they don't want me to run," he said. "They understand perfectly how ephemeral the support for them is." That support certainly looks strong: The latest independent poll, conducted this month by the Levada Center, suggests 75 percent of Russians would vote for Putin. People in much of Russia back Putin as a matter of course, and Navalny supporters are routinely heckled, arrested and fined when they try to spread their message. But there are also signs that enthusiasm for Putin may be starting to wane. 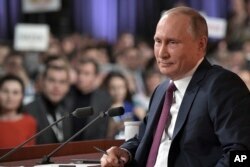 Another Levada poll, conducted in April, found that 51 percent of people are tired of waiting for Putin to bring "positive change" — 10 percentage points higher than a year ago. Both polls surveyed 1,600 people across Russia and had margins of error of 2.5 percentage points. Navalny hopes to capitalize on that discontent. "Putin has nothing to say," Navalny said. "All he can promise is what he used to promise before, and you can check that these promises did not come true and cannot come true." Navalny gets out his message on social media, using Twitter and Telegram and broadcasting a weekly program on YouTube. But television — the main source of information for most Russians — remains off limits because it's controlled by the government. Other opposition candidates are expected to run, notably socialite Ksenia Sobchak, the daughter of Putin's mentor — but there is wide speculation that her candidacy is a Kremlin plot to split Navalny's support. The only other candidates who are critical of Putin have too little support for the Kremlin to view them as threats. FILE - A journalist looks at a computer screen displaying Ksenia Sobchak's campaign web page, in Moscow, Russia, Oct. 19, 2017. Putin himself has announced his re-election bid but so far refrained from any campaigning events. Even so, his face is everywhere — at his annual news conference last week, carried live for nearly four hours on Russian television, he touted his accomplishments and even taunted Navalny — but stuck to his practice of not saying his name. Navalny was not a candidate during Russia's last presidential election in 2012, but he spearheaded massive anti-government protests that rattled Putin. Amid dwindling popularity, Putin seized Ukraine's Crimean peninsula and threw support behind separatist rebels in eastern Ukraine, striking a chord with millions of Russians who felt like losers in the outcome of the Cold War. Now, people are tiring of the Ukrainian conflict and becoming more focused on their own economic woes, providing fertile ground for Navalny's message. Navalny published his full election platform last week, focusing on fighting corruption and funneling more money into education and health care. He calls for a windfall tax on oligarchs and huge cuts to Russia's bloated bureaucracy. Unlike Putin's focus on foreign policy, Navalny's platform is almost entirely domestic, which he credits for growing support in places like Novosibirsk, Russia's third-largest city, where he drew a large crowd in October. "Our government is in the grip of illusions. They deal with Syria and they're not interested in what's happening in Novosibirsk, and people there feel it," Navalny told the AP. "That translates into the fact that I'm receiving more support." The blue-eyed Moscow lawyer first made his name in 2009 when he began publishing investigations into corruption at Russia's biggest state-owned companies. When the AP first interviewed Navalny in 2010, he was a lone wolf, but he has since acquired allies and supporters who have made investigations into official corruption their full-time job. FILE - In this photo provided by Evgeny Feldman, Alexei Navalny is detained by police in downtown Moscow, Russia, March 26, 2017. 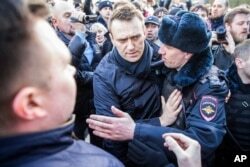 With the visibility came the backlash: The 41-year-old Navalny has been convicted on two sets of unrelated charges, and his brother was sent to prison in what was largely viewed as political revenge. A conviction on one of the charges bars Navalny from running for public office without special dispensation — and the election official who will consider that request in the coming weeks has already said she sees no legal grounds for him to run. In his only formal election campaign, Navalny ran for Moscow mayor in 2013 and got nearly 30 percent of the vote. His presidential bid began a year ago, when he started to build a network of supporters across Russia. He currently counts over 190,000 volunteers, most of them young, from Russia's western exclave of Kaliningrad to Vladivostok on the Pacific. His supporters have opened campaign offices in 83 cities and towns, including many where Putin is accustomed to winning by a landslide. On his most recent visit to Putin's heartland, 1,000 people braved temperatures of -15 Celsius (-5 Fahrenheit) to hear him speak in the industrial town of Novokuznetsk, where Putin got 77 percent of the vote in 2012. Many of those in the crowd sounded weary of the president but said they saw no alternative. Asked about Navalny, many said they had heard very little about him. While Navalny has captured the attention of a younger generation and the politically active via social media, he conceded he won't be able to reach the broader population as long as he is barred from state television. "We have won among the active political class despite the ban," he said. "The politically active class will turn the politically dormant one in our favor. It's going to happen in this election if I'm allowed to run."